We all have our favorite Beatles story or moment. There are so many to choose from: Ed Sullivan, the Maharishi, Yoko Ono, and so on. The Beatles in Comics, a new anthology from NBM Graphic Novels, does a wonderful job of sorting out fact from fiction and proves to make a great Beatles keepsake. You can see it as an ultimate scrapbook as it’s everything a Beatles fan would want to include in a tribute and then some. Another example is the famous trip to India to confer with the Maharishi. This portion of the book is a prime example of how each segment is built up: some introductory notes, some actual photos and reference material, and then the comics. Each section has a different cartoonist at the helm. The whole volume is utterly remarkable in how it seems to effortlessly manage to substantially cover everything from the band’s initial formation all the way to their inevitable breakup. The Beatles in Comics is a 224-page full color hardcover published by NBM Graphic Novels. An announcement about a graphic novel based on The Beatles Yellow Submarine was one of the most popular posts on Comics Grinder. Well, here is a full-on review (with video) that delves right into the book! 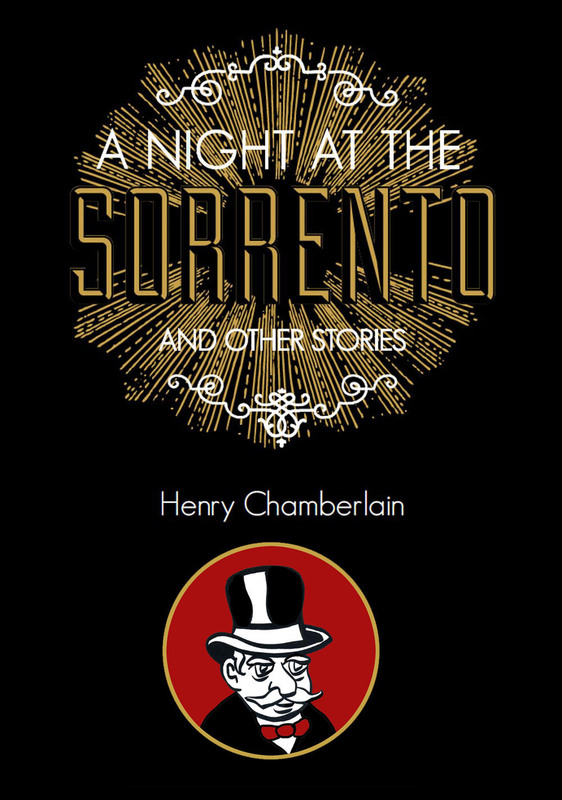 This is the official illustrated adaptation, published by Titan Comics. 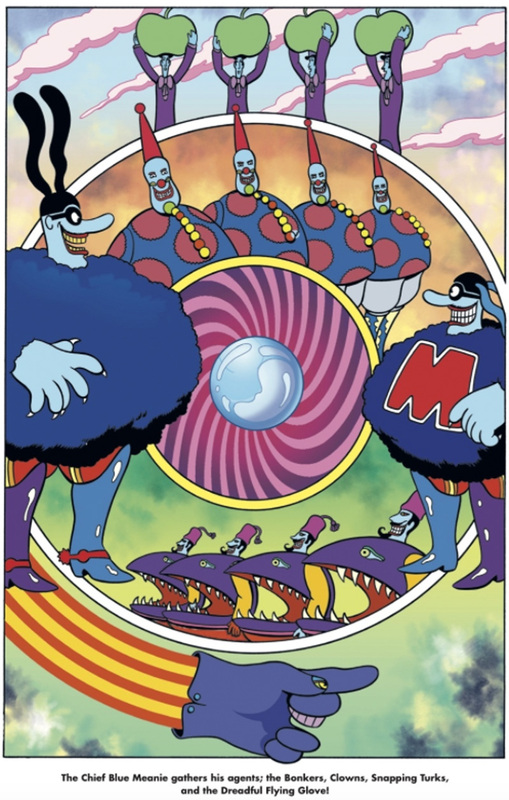 When the music-hating Blue Meanies invade the underwater paradise of Pepperland, the Captain of the Yellow Submarine sails away to find help… and stumbles upon The Beatles! Can the Fab Four free Sgt. Pepper’s Lonely Hearts Club Band, return music to Pepperland, and overthrow the evil Blue Meanies through the power of love? This book beautifully and faithfully adapts all the antics and charm of the original animated feature. It’s genius to create such a work. Who doesn’t love The Beatles? And who can resist a book that transports you to Pepperland and beyond? Here is a perfect gift for any Beatles fan. And it can make for a dazzling bedtime story too! The layout to this work is quite impressive. 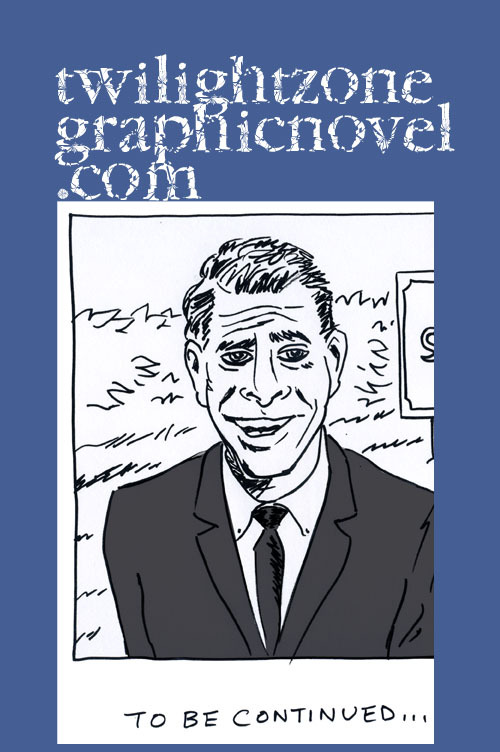 The pacing is spot on as it captures the wacky and irreverent humor. An adaptation of this scope and significance requires a master and that is exactly what we get from writer/artist Bill Morrison, co-founder of Bongo Comics, artist on classic Disney posters, and editor of Mad Magazine. 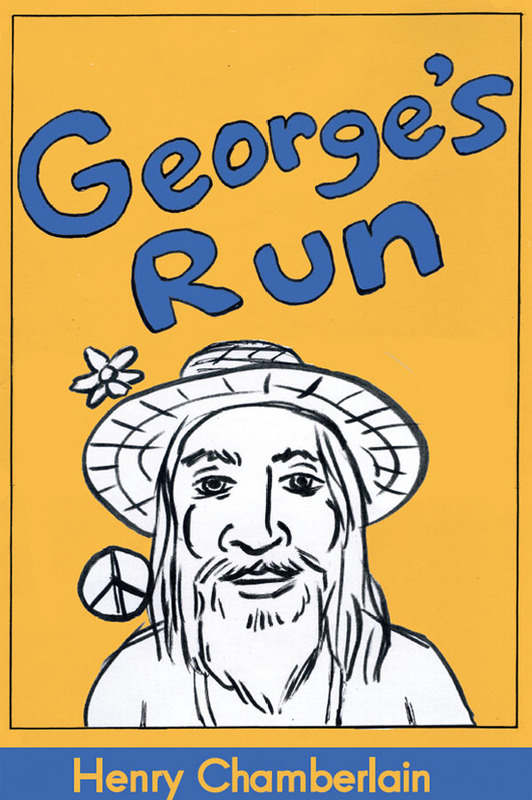 Usually, it works the other way around but Mr. Morrison has managed to take a legendary work in animation and find a viable graphic novel counterpart. He has done a wonderful job of sequencing a narrative from something that is both iconic and rather loopy and might seem impossible to properly transfer from one medium to another. There is plenty to love here. All you need is love, right? 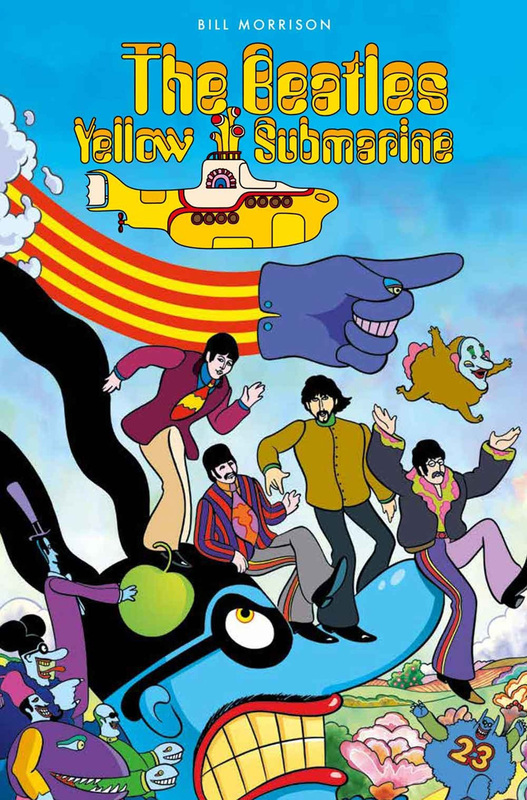 The Beatles Yellow Submarine is a 112-page hardcover, in full color, published by Titan Comics. 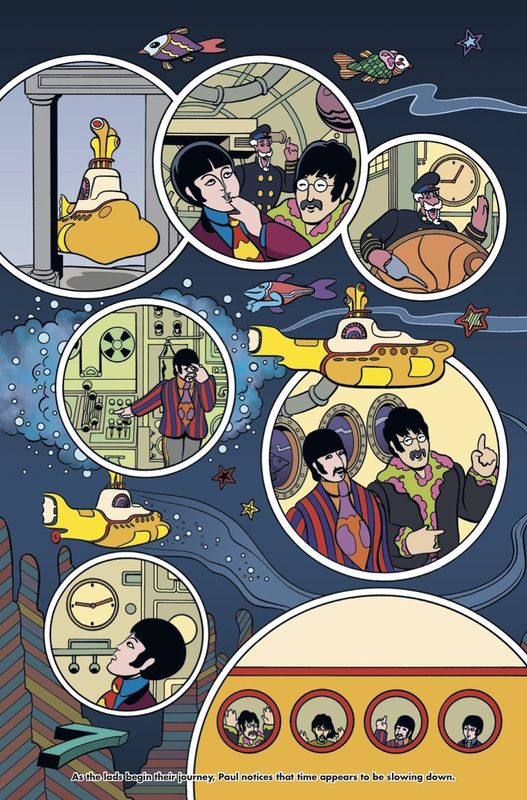 What could be sweeter than a graphic novel adaptation of The Beatles’ Yellow Submarine? Yes, Titan Comics has announced a licensing agreement with Apple Corps Ltd to publish such a work! The fan base for The Beatles is in a league all its own so this is a huge deal. If no Blue Meanies get in the way, the book will coincide with the animated film’s 50th Anniversary! The comic adaptation will be written and illustrated by Bill Morrison, Bongo Comics co-founder and creative director, as well as recently announced Executive Editor for MAD Magazine. The Beatles: Yellow Submarine official illustrated adaptation will launch in stores in 2018, to coincide with the 50th Anniversary of the animated musical fantasy film released in July 1968. Directed by George Dunning, Yellow Submarine was an animated adventure inspired by the music of The Beatles. 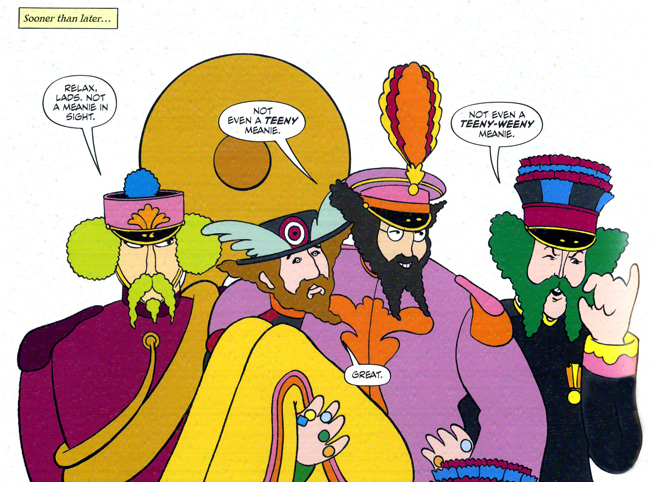 Band members Paul, John, George, and Ringo join Captain Fred in his Yellow Submarine to journey to Pepperland to help free the land from the music-hating Blue Meanies. Brian Epstein was in search of greatness. He found it with a ragtag band in a little basement club. These lads from Liverpool were not just any ragtag band. Brian Epstein was an expert on pop music and knew right away that The Beatles were special and could use his help. 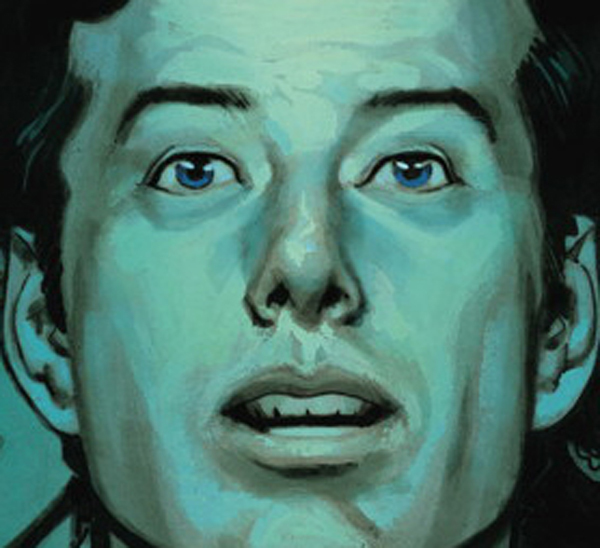 And so Brian embarks upon his true calling which is faithfully retold in the graphic novel, “The Fifth Beatle: The Brian Epstein Story,” published by Dark Horse Comics, for their imprint, M Press. To be a homosexual in England in the 1960s could land you in prison. And to be Jewish could put your life at risk during a time of great anti-Semitism. Brian was both and very much aware of the danger. However, he wasn’t someone to be pushed around with either. The script by Vivek J. Tiwary, a Broadway producer and avid Beatles fan, gives us a portrait of a determined young man who is very passionate about music and style. But it’s not just a passion, it’s a way of life: You can conquer the world if you look the part. This worldview is essential and part of what Brian will instill in The Beatles. Just like a well dressed matador wows the cheering crowds, so the well dressed image of The Beatles will wow the world. The artwork by Andrew Robinson (Star Wars, Batman), with contributions by Kyle Baker (Plastic Man, Why I Hate Saturn), transports us back quite nicely to the good cheer and irreverence of the young band led by the young old soul Epstein. We see Epstein go from running the family business, the record store, Nems, to managing The Beatles. By sheer determination, Epstein continues on course believing in the band’s potential more than the band had ever dared dreamed themselves. Andrew Robinson has a deft touch with facial expression and body language. His engaging character development brings the lads and their magnificent manager to full life. The challenge in writing such a book was starting out with a relatively small amount of information on the subject. Of course, any true Beatles fan or serious scholar of pop culture knows that Brian Epstein was The Beatles manager–but not much more. What Vivek does is pretty amazing. It’s not impossible, no doubt, but it’s an ambitious goal to take any compelling figure and tell their story. It has been a project that Vivek has been building up for some twenty years, beginning as a youth fascinated with the entertainment business and evolving as simply a love for the man himself. This tribute to Brian Epstein is spot on and will inspire. Told in three parts, this story unfolds at a fast pace. Given the roller coaster of events, that rings true. In only six years, from 1961 to 1967, Epstein took a promising, but unknown, band and did as he vowed he’d do, made them bigger than Elvis. Along the way, we have time for some fascinating extended scenes that give us insights into what it was like for Epstein, both personal and professional. We come to see just how painfully lonely he was. And we see him navigating some unusual business dealings. The scenes with Colonel Parker and with Ed Sullivan are interesting. And to think it all came to an end for Brian Epstein at the age of 32. The Beatles would only last another couple of years after his death. But, that end was just one end. The music lives on. 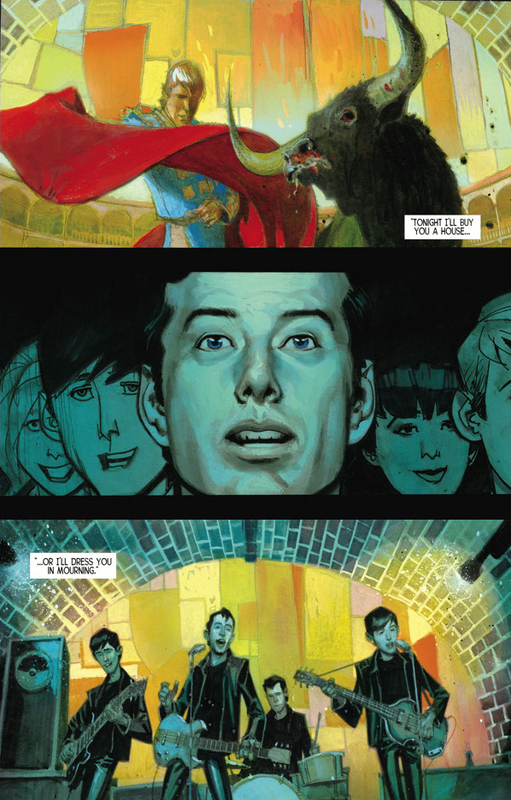 And, with this book, the story of Brian Epstein lives on in this compelling work. 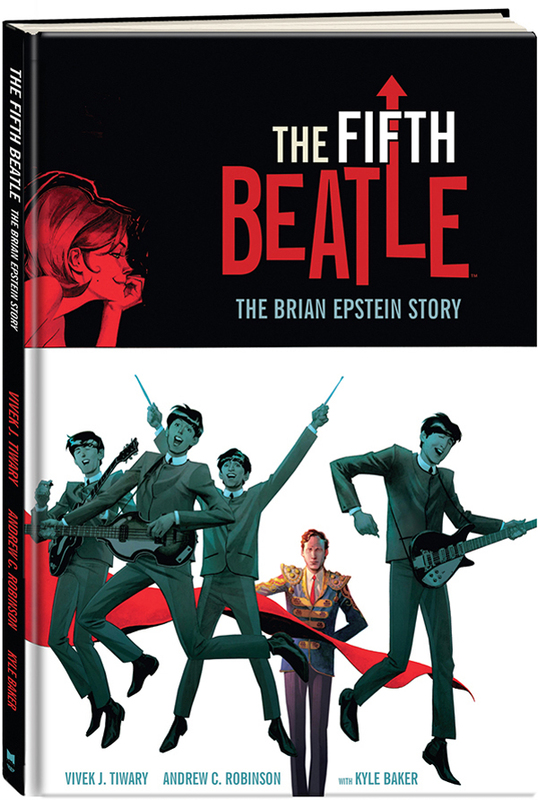 “The Fifth Beatle: The Brian Epstein Story” is a 144-page hardcover, priced at $19.99, and available as of November 19, 2013. Visit our friends at Dark Horse Comics here. And be sure to visit The Fifth Beatle website here. 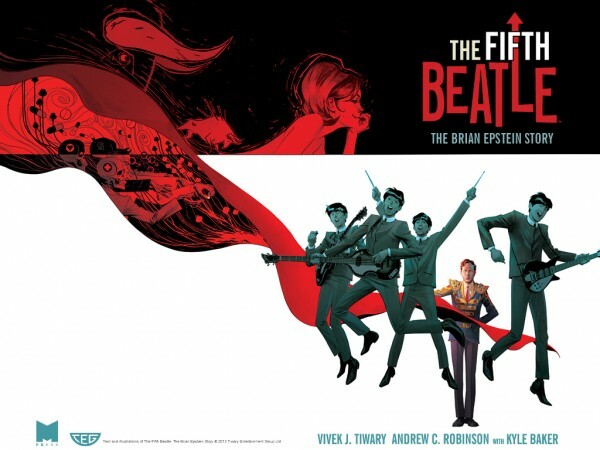 From writer Vivek J. Tiwary and artist Andrew C. Robinson – THE FIFTH BEATLE (TheFifthBeatle.com) is a graphic novel recounting the untold true story of Brian Epstein, the brilliant visionary who discovered the Beatles in a cellar in Liverpool, nurtured, protected, and guided them to international stardom, and died extremely successful and painfully lonely at the young age of 32. Published by M Press Books, a division of Dark Horse Comics, The Fifth Beatle will officially be released November 19th! This marks the first full-length graphic novel painted by fanboy favorite Andrew C. Robinson (Dusty Star, King Conan, Starman, Superman). 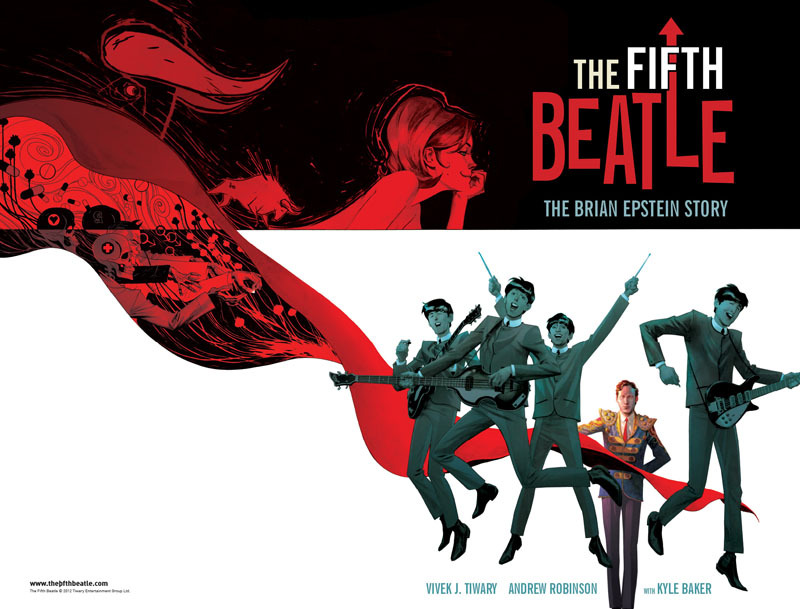 THE FIFTH BEATLE is a graphic novel and feature film recounting the untold true story of Brian Epstein, the brilliant visionary who discovered the Beatles in a cellar in Liverpool, nurtured, protected, and guided them to international stardom, and died extremely successful and painfully lonely at the age of 32. Dark Horse Comics is proud to publish the graphic novel and it is going to come out in style. Keep up with THE FIFTH BEATLE at its site here. The book releases November 19, 2013.